Showing 3 articles from January 10, 2013. 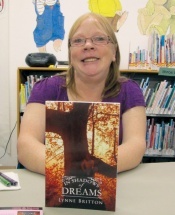 Local authors Shawn Inmon, of Mossyrock, and Lynne Britton, of Winlock, met readers Tuesday at the Winlock Timberland Library to sign and read from their first novels and discuss their next works. a Raymond resident died Monday, January 7, 2013 at the Willapa Harbor Care Center in Raymond; he was 64. He was born November 30, 1948 in Cherokee, N. Caro. to Luther Anderson and Rose Marie (Sutton) Stepp.